*I wrote this a few years back while I was still in corporate. Taking a break from dipping in the ocean, I was given the opportunity to visit Zamboanga del Norte’s capital, Dipolog City. Aside from its fame due to its wild orchids and sardine industry, I discovered how locals enjoy their city’s attractions - street food at Sunset Boulevard. Street food has been a staple top on my list of cheap thrills. I thought Davao City had the cheapest street food yet I was utterly surprised during my visit to Dipolog’s Sunset Boulevard. Street food here is cheap with larger servings too. The largest Florida mangoes I’ve ever seen were found in Dipolog’s Sunset Boulevard. These huge fruits were only found in one stall among the many mango vendors that were lined up on the road. My food buddy, Jiselle and I arrived in Dipolog on a Sunday afternoon and upon checking in at our hotel, went to Sunset Boulevard for a quick afternoon snack. As expected, the Boulevard was already busy with lots of families unwinding by the sea, couples spending quality time waiting for the sun to set and teenage boys playing basketball. Immediately craving for fried street food, we went for a beeline to the fried section of the Boulevard, which was located near the basketball court. Chicken skin costs only Php 10 and placed in a decently-sized plastic, overflowing. They don’t serve vinegar along with it but freshly cooked chicken skin was good enough eaten plain anyway. Adding a really large fried isaw on a stick, which costs only for Php 5, my cravings for fried goodies was satisfied. 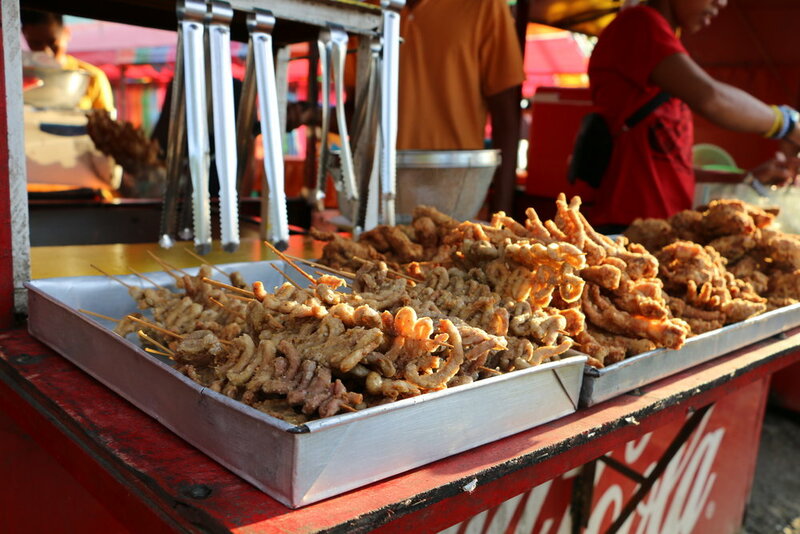 Hot, salty and fried to its golden state, these fried isaw (chicken intestines) are a street food lover’s delight, all found in Sunset Boulevard’s fried food area. As we were munching on our crispy fried chicken skin, we saw a fishball vendor nearby. My friend, Jiselle craved for kikiam and we ended up with kikiam and 2 pieces of fish ball for Php 5 each. The largest green mangoes I’ve ever seen in my 24 years of living. One plastic pouch of peeled green mango costs only Php 10, additional Php 5 for shrimp paste (bagoong). I highly suggest to try it with the bagoong since the way their bagoong is cooked is different, savoury with just the right touch of sweetness. Freshly fried kikiam straight out of the pan. This vendor is one of the limited vendors selling freshly made kikiam, squid balls and fish balls. I think this was the first time in three years that I ate balut. We tried the 16 days variety and three eggs cost Php 54. With the option of ‘dining in’ at the vendor’s stalls, they serve the eggs together with chili salt and native vinegar. To wash everything down, or last stop was at a fruit shake stall where a 250-ml buko shake costs Php 30. Almost same with Davao prices and tastes the same too. I guess buko shakes are consistent all throughout Mindanao. It was refreshing and cold, perfect combination to walking the whole 1.6 kilometer stretch of Sunset Boulevard. Definitely placing Dipolog’s Sunset Boulevard at the top of my cheap thrills list. I wonder how many more places are like this in Mindanao. I think I still have a lot of eating and seeking to do. Got any leads? Let me know! Dipolog’s Sunset Boulevard is aptly named as one can view a breathtaking sunset even on a cloudy day such as this. A normal Sunday afternoon in Sunset Boulevard can be a sight full of families strolling after church, a busy road with young people on motorcycles and lots of food stalls from grilled to fried or iced delights.